Today, on my front porch, I was faced with a dilemma. I was a witness to an act of nature, an act that is repeated a billion times each minute here in the North Woods. If you factor in the endless variations on this particular situation that occur world-wide, then the number is incalculable. But I was allowed a peak of only one such entanglement. And, that is what it was. An entanglement. As I stepped off the porch onto the ramp leading to the new stone walkway, something caught the corner of my left field of vision. It was under the cornice of the roof, you know, where the giant icicle grows from November until late April. The mass of this ice, building drop by drop, grows into something large and frightening as a homegrown glacier. Take a portion of Niagara Falls..drop the temperature to -75 degrees and you have an inkling of what drapes itself off the corner of our roof. I’ve considered renting it out to ice-climbers for weekend workouts and crampon practice. Thank heavens it’s over the guest room. What caught my eye was a rather large dragon-fly. We have hundreds of them on our back deck. I, who have a revulsion to mosquitos, black flies, spiders, snakes and larger-than-mouse-size rodents (I can’t bring myself to even utter the word), find dragon flies beautiful and non-threatening. It’s about the only flying insect in the entire Adirondacks that is non-threatening (you can’t count moths and Monarch butterflies). The dragon-fly mates while flying and the males is upside-down and backwards, but delicate eyes and minors might be reading this blog so I can’t go into details. One sat on my knee a few days ago. It was so passive and friendly, I almost gave it a name and thought about taking it for a walk. They don’t make leashes that small, however. My appreciation for the dragon-fly increased 1,000 % when Mariam told me she saw one eating small gnat-like things in mid-flight. Now, there’s a bug I can like. I had forgotten about seeing the spider’s web a few days before. I asked Mariam if I should swipe it away…not a good thing for visitors to see as they approach our front door. We thought for a moment and decided to leave it unmolested. After all, you don’t have to be Charles Darwin or John Muir to know that spiders eat insects. (Remember, I don’t like insects…or spiders, so that was a whole other dilemma for another blog). Back to the imprisoned dragon-fly. I hadn’t noticed the web so I tickled it ever so slightly. It jumped to life and tried to fly away. But it was caught by the spider. That’s the moment when the enormity of the situation hit me like a lug nut flying off a truck on 7th Avenue. Should I walk away, not interfering with the cycle of nature and let the spider feast on the fly? Or, should I deprive the spider of its honestly won reward of good home-made fly goo? I couldn’t help but to insert the human factor (mine) into this picture. “Take Nothing But Pictures & Leave Nothing But Footprints” is what all the signs tell us when we are in an area of great natural beauty. And, this scene on my porch was natural beauty. My choices were simple: do nothing and let nature “happen” i.e., the fly gets eaten, or free the fly. Now if I interfered by freeing the fly, said fly would, hopefully, go off to eat more insects that annoyed the hell out of me. I win. The dragon-fly wins. The spider loses. Before I raised my hand, I considered further ramifications. If the fly dies early for lack of food, he/she may not have a chance to reproduce, thus lessening the overall number of spider in the future. If I let the fly die, there may not be time to reproduce, thus lessening the future generation(s) of dragon flies. Therefore, more annoying insects. I tried to project this dilemma into the distant future. 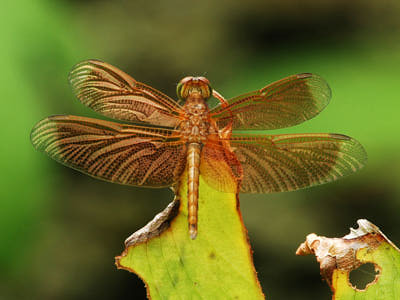 One pair of dragon flies can, conceivably, be responsible for millions of future generations of their species. The same goes for the spider. My actions, in the real natural world, would have far-reaching consequences. I decided to take a moral leap into the unknown. I freed the dragon-fly. It didn’t hang around long enough to thank me. Probably because it had some time in the web contemplating its short term future. They’re not that stupid. What made me decide to do what I did? I think it was, while I was mulling the situation over, I was attacked by a mosquitos. I deprived the mosquito of future generations by smashing it into a bloody spot on my forearm. This entry was posted in Blogging, Everyday Events, humor, Nature, Real Personal History, satire and tagged Adirondacks, black flies, Charles Darwin, cycle of life, dragon fly, John Muir, life and death dilemma, moral dilemma, mosquitos, spider webs, spiders. This is so funny! Awesome writing as always.